JMS Mega-SETTLER (Plate Settler System) is one of the most effective plate settler systems. 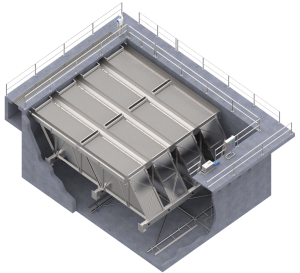 With such key features as Top Flow Control Angle (TFCA™), Dual Side-Loaded Effluent Troughs, and Adjustable V-Notch Weirs (2VNP™) JMS Mega-SETTLER will improve effluent quality in a smaller footprint. 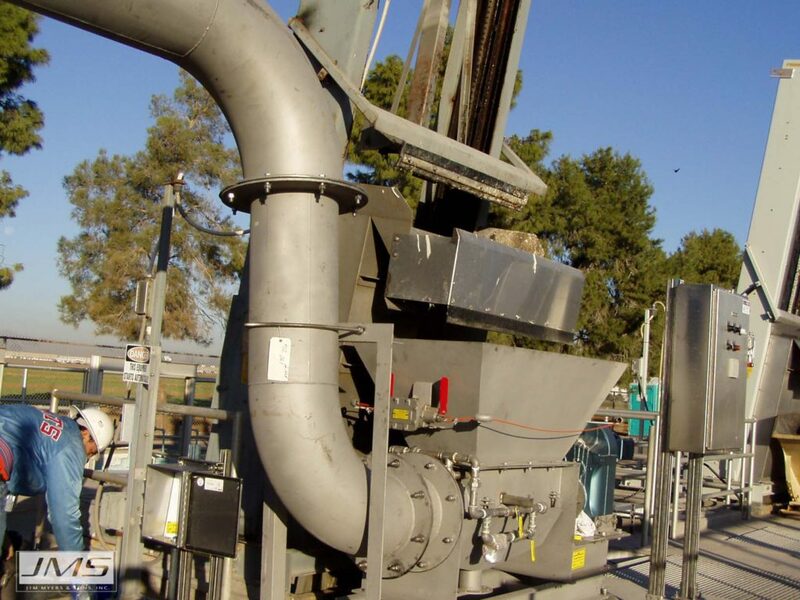 JMS Mega-VAC (Sludge Removal System) is one of the most effective hoseless sludge removal systems available to date. 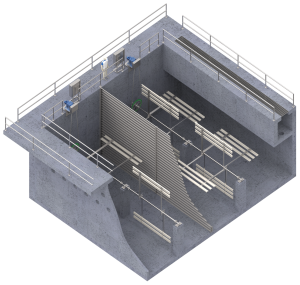 With such key features as Telescoping Seal Assembly (patented pending) and Flow Balancing Diagonals the Mega-VAC efficiently removes sludge from wall-to-wall. 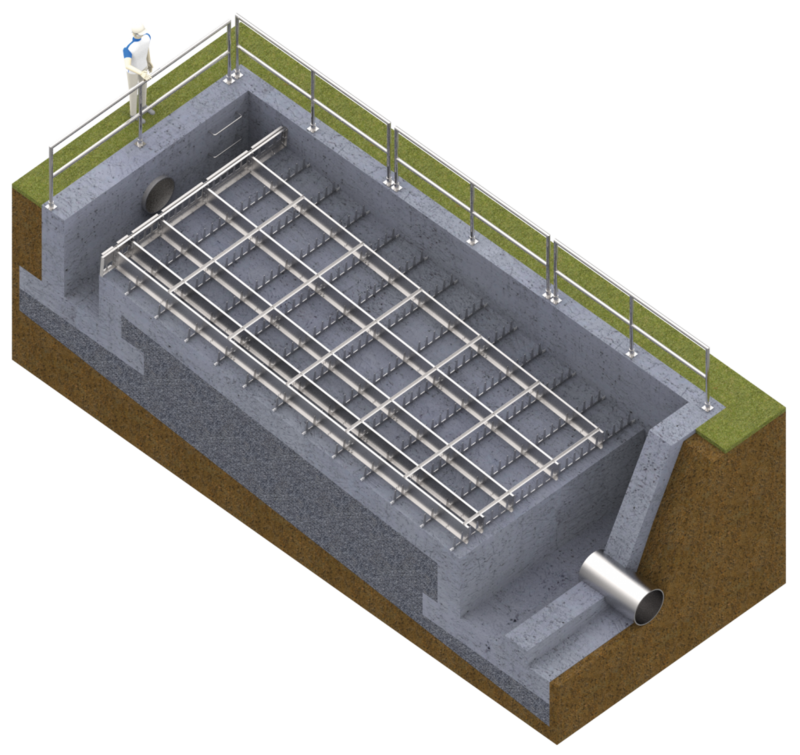 JMS Mega-SCRAPER (Sludge Removal System) is one of the most effective scraper type sludge removal systems. With such key features as Energy Transfer Triangle and hydrodynamic Scraper Blades, the JMS Mega-SCRAPER is the best scraper sludge removal system available. 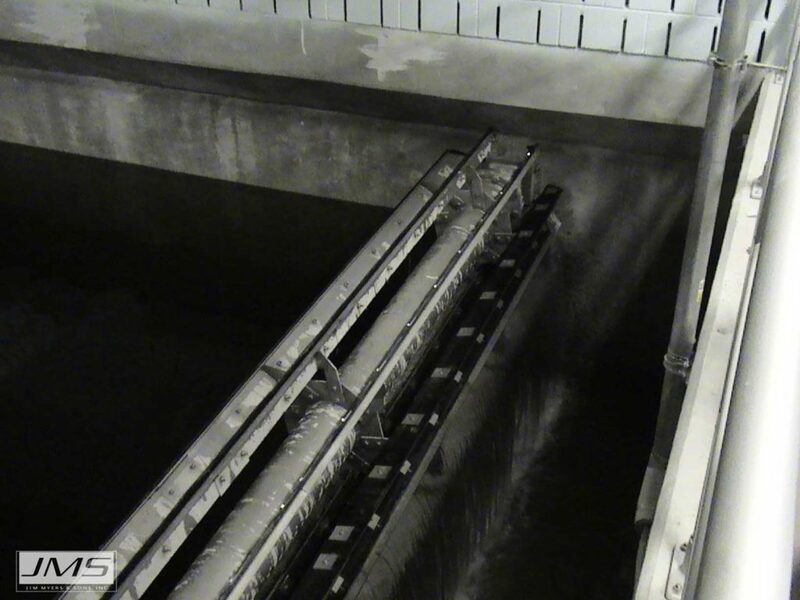 JMS Mega-FLOC (Horizontal Paddle Wheel Flocculator) is one of the most low maintenance flocculators available today. With such key features as JMS Shaft Connects, Stainless Steel Bearings and Drive Sprocket they are ideally suited to provide the best value for large production plants. 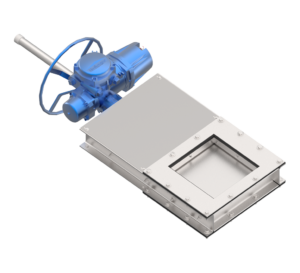 JMS Mega-FLOC (Vertical Paddle Wheel Flocculator) offers a wide range of flexibility with easy installation. With such key features as JMS Shaft Connects, Chain Coupling, and Radial Thrust Bearing the JMS Mega-FLOC (VPWF) provides maximum longevity and reliability. 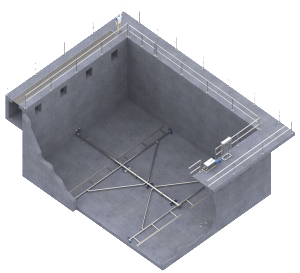 JMS Mega-FLOC (Walking Beam Flocculator) is the best option for optimal flocculation performance. 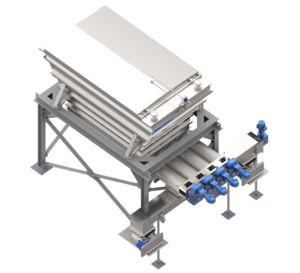 The reciprocating vertical paddle motion allows for the Mega-FLOC (WBF) to create the best flocculation. With such key features as the JMS bearings and paddle assembly it is no wonder the JMS Mega-FLOC (WBF) is the most optimal flocculator. 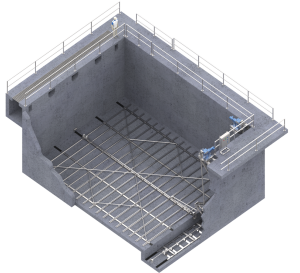 The JMS in-house engineering and fabrication teams have designed and built numerous Storage Hoppers, Bins, and Silos for sludge applications. 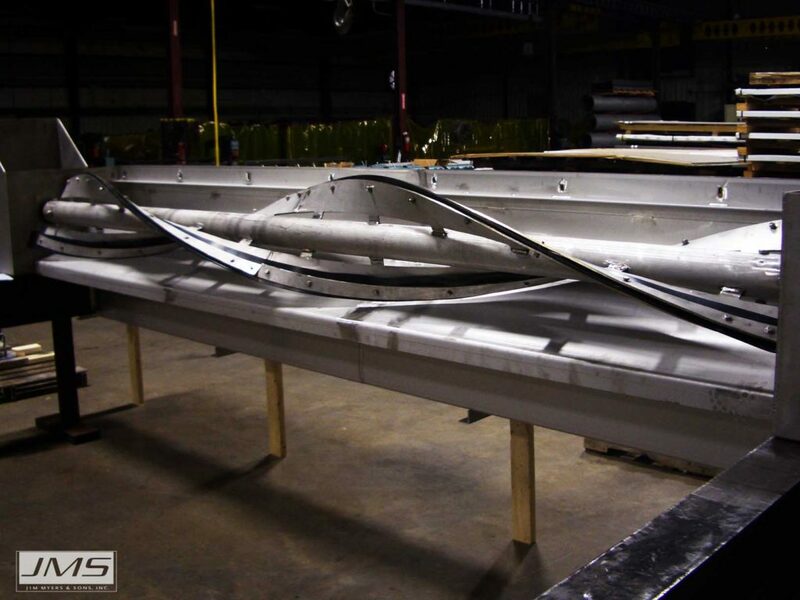 These vessels can be manufactured from stainless steel or painted carbon steel and are typically used in conjunction with JMS Live Bottom Feeders to provide a metered discharge. 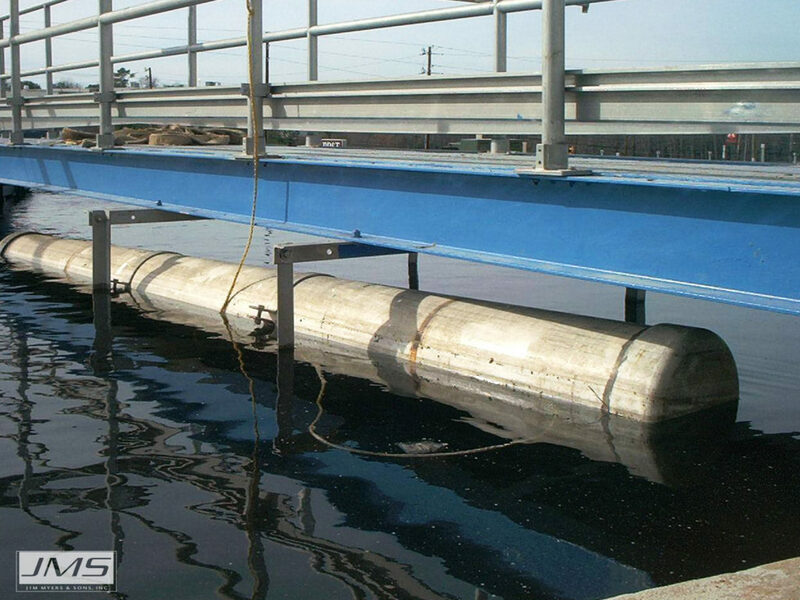 JMS Bio-BELT (Belt Conveyors), in use in numerous wastewater treatment plants across the country and internationally, are typically designed to transport materials such as dewatered sludge and screenings. 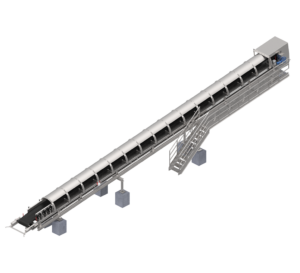 Available with either a troughing belt or flat belt with corrugated side-walls, this type of conveyors can transition from horizontal to incline. All JMS Belt Conveyors are built to strict CEMA standards. 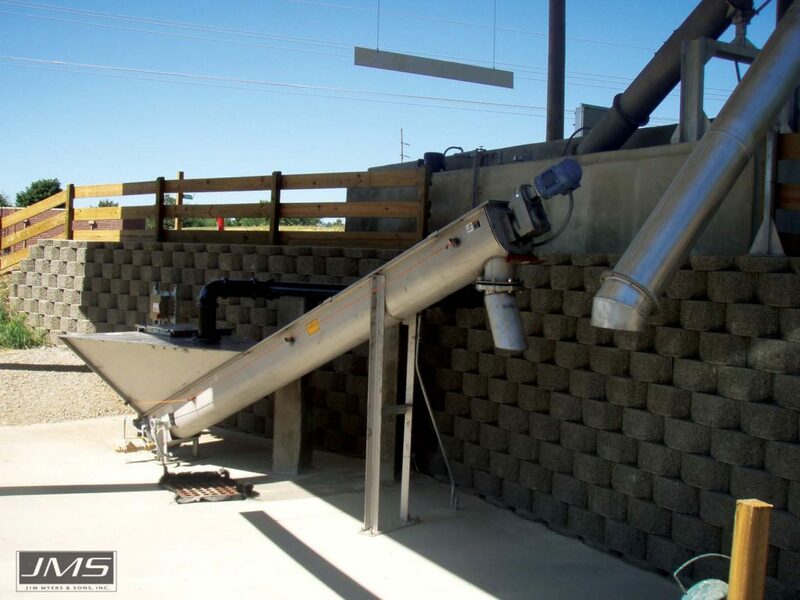 JMS Bio-SCREW (Screw Conveyor) consists of Shafted and Shaftless Screw Conveyor, in use in numerous wastewater treatment plants across the country and internationally, are typically designed to transport materials such as dewatered sludge and screenings. 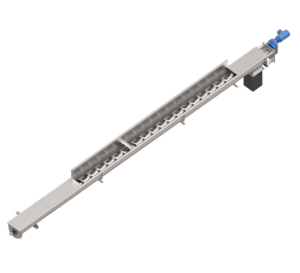 All JMS Screw Conveyors are built to strict CEMA standards. JMS Bio-VALVE (Diverter Valve) consists of 2-way and 3-way diverter valve for solid materials and the JMS Centrifuge Diverter Valve, which handles liquid concentrate from the centrifuge during startup and solid sludge from the centrifuge once the sludge is consolidated. JMS Bio-GATE (Slide Gate) are typically used with screw conveyors that have multiple discharges or on the bottom of hoppers and bins. JMS Slide Gates are generally manufactured from stainless steel and can be operated either with a manual handwheel or an electric actuator. 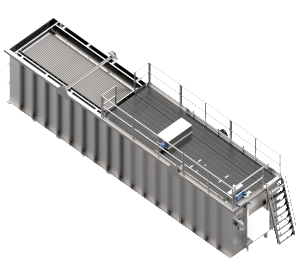 JMS Delta-COMPACTOR (Screening Compactor) is designed for efficiency and to eliminate clogging issues. 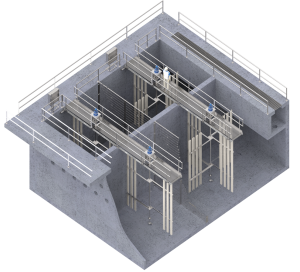 The simple, proven design consists of an inlet hopper, drainage section, compaction section, spray wash header, discharge piping, drives, and motors. It is designed to minimize screw flight wear and provide longer gear reducer life. 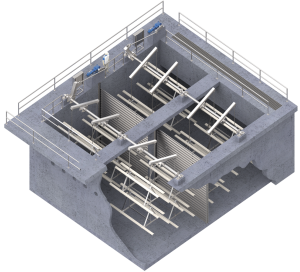 JMS Delta-CLASSIFIER (Grit Classifier), also known as Grit Separators, are designed to separate and convey and dewater grit, sand, and other heavy materials from wastewater. 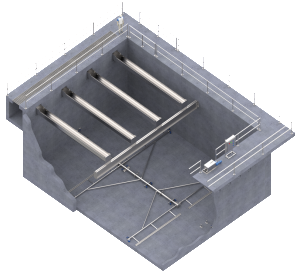 With installations since 1989, JMS is highly-respected for its packaged systems which include the classifier chamber and accompanying system. JMS Delta-DECANTER (Decanting System) line of level-control products includes the Floating Decanter and Swivel-Joint Floating Decanter. 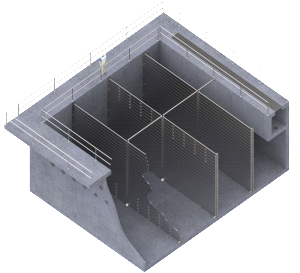 Constructed of high-quality, corrosion-resistant materials, these systems are essentially maintenance-free. 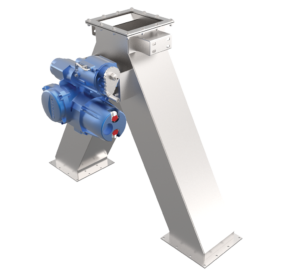 JMS Delta-SKIMMER (Scum Pipe System) are typically stainless steel, but are available in a variety of construction materials and in diameters from 6” to 24”. These systems are designed for extended service life with UHMW non-metallic end bearing assemblies. JMS has the capabilities to furnish the complete package specified (lever, linkage, hand-wheel, or electrically-actuated operation). 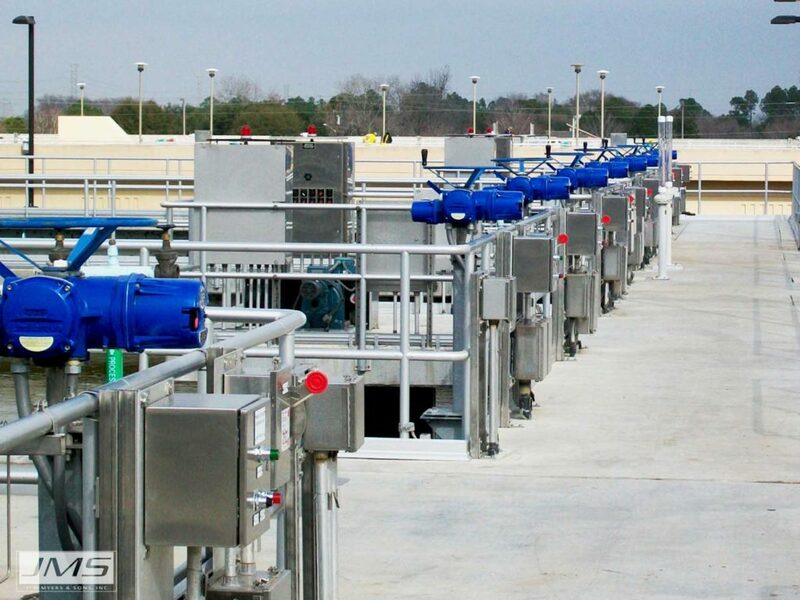 JMS offers Delta-SKIMMER (Paddle-Wheel Skimmer) and Delta-SKIMMER (Helical Skimmer) for Dissolved Oxygen Floatation Systems along with traditional floating sludge applications. JMS Delta-TSV (Telescoping valve) are designed to control the height of liquid in a pond, reservoir, or other holding area. JMS TSV’s are available as manual or power actuated operation, and in sizes from 4 to 16 inch. JMS Delta-PUMP (Airlift Pump) are available with capacities up to 6000 gpm. Airlift pumps have the advantage of not having liquid come in contact with any mechanical elements, so these pumps are especially useful in grit applications. 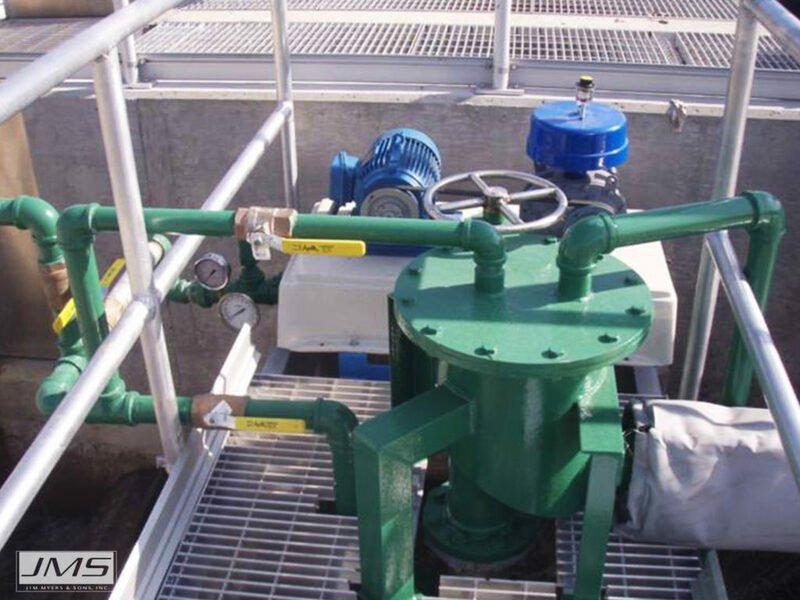 Our airlift pumps can be manufactured from stainless steel, painted carbon steel, or aluminum, and come complete with a blower and acoustical enclosure. JMS Eco-AIR (Low Profile Cascade Aerator) is one of the most economical post aeration systems ever designed. 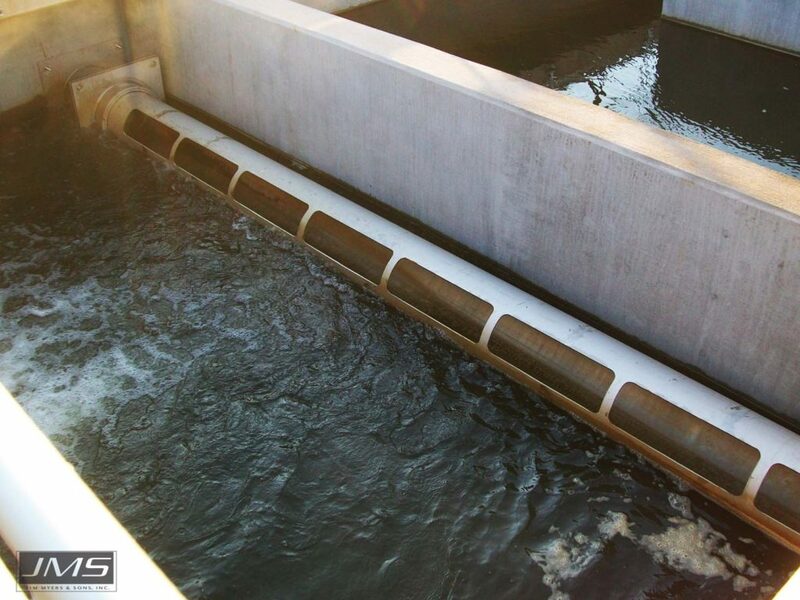 With such key features as Air Infusion Plates, Leaping Weirs, Influent Control Gate, and Minimum Flow Control Gate it is no wonder why JMS Eco-AIR (LPCA) is the most economical post aeration system on the market today.